An independent research group called Science for the Masses have developed eye drops that allow the user to identify symbols and people in darkened areas up to 50 metres away. Could “increased light amplification” be a cure for night blindness? 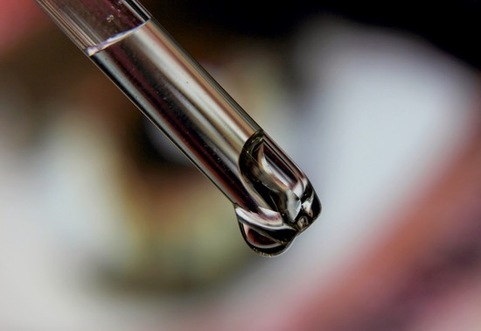 The eye drops contain a combination of insulin and chlorine e6 – the same chlorophyll analog that has been used for many years in the laser-assisted treatment of cancer. Ce6 amplifies light, allowing surgeons to harness the energy from low-power sources to destroy tumours. Recent research has found that Ce6 could also be used to treat night blindness and improve the vision of people with certain visual disturbances, through direct application to the eye. In the study, the eye drops were administered to a subject who was then asked to identify symbols, colours and individuals at varying distances and against a variety of background colours in a darkened environment. A similar control group of four who had not received the eye drops were also asked to view the same items. The subject was consistently able to recognize symbols and individuals which the control group could not. Most notably, the subject was able identifying individuals in a dark wooded area with 100% accuracy against 33% among the control group. Further tests are now planned to validate the initial findings, and people are warned not to administer Chlorine e6 to themselves as this could be extremely harmful to eyes in an uncontrolled environment. 'Night-vision-eye-drops' improve vision up to 50 metres in dark. A Review on Night Enhancement Eye drops using Chlorine e6. I would like to know if my son who has Usher syndrome with RP and tunnel vision in his eyes. will be benefited by these eye drops. Dear Lata Varma, good to hear from you. The eye drops in question have been developed by an independent research group called Science for the Masses. You would need to contact them to find out if further tests have been carried out, and if the eye drops be appropriate for your son. Here is the link to the source article in which you will find the contacts, but we would stress that Chlorine e6 can be extremely harmful to eyes in an uncontrolled environment and under no circumstances should you try the treatment at home.